Obsidians can come in different colors, but are mostly black. The reason they’re called rainbow obsidian is because when you polish the black surface and expose it to light, you can see the colors of the rainbow. Eye is in the name because the obsidian beads resemble a human eye. The stone comes from volcanic glass and best finding is in the Switzerland Alps, although it is collected from various locations around the Earth. 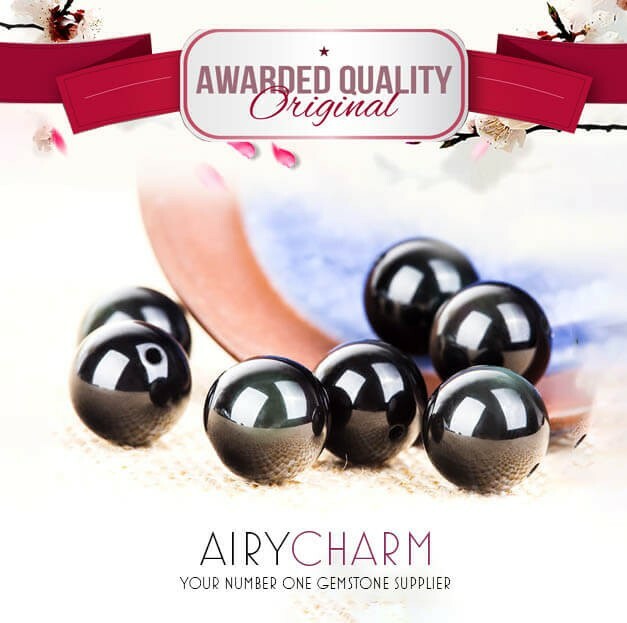 Because of its stunning black color and beautiful surface, obsidian rainbow eye is used for making jewelry, amulets, or decorations. We offer it in the form of gorgeous beads that come in different sizes, so you can make any type of jewelry you want, whether it’s a beaded necklace or bracelet. 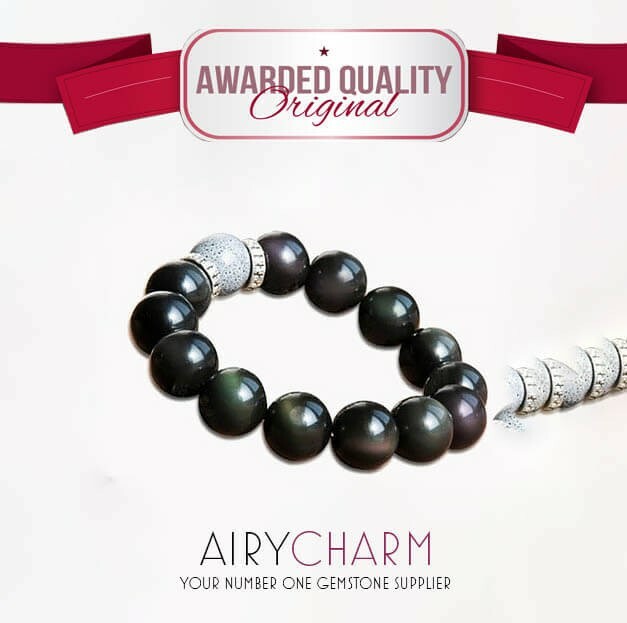 The deep black color with lighter rainbow touches makes for an elegant and classy jewelry that everyone will envy. Obsidian looks very mysterious, powerful, and luxurious. It is obvious that obsidian rainbow eye is a very stunning gemstone that can be a perfect accessory, but it also has strong metaphysical powers. You should have this stone in possession if you want to be protected against negative energies and attract joy and peace to your life. 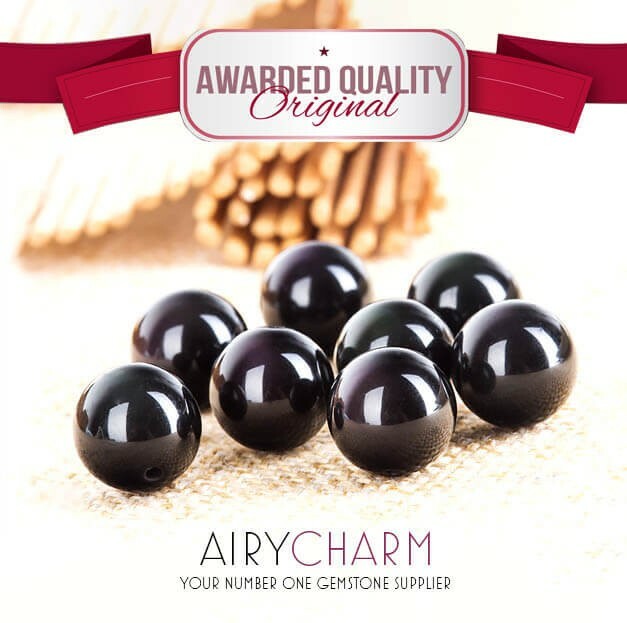 Obsidian is particularly recommended for sensitive people who are introverted and are often troubled by what other people say, as well as their turmoil going on in their minds. If you find yourself having a lot of negative thoughts in your inner dialogue or overthink everything, you can greatly benefit from obsidian rainbow jewelry. It will clear out all the unnecessary noise from your mind and get rid of that negative energy. Obsidian also protects you from other people who have bad intentions or want to hurt you in any way. Rainbow obsidian is also beneficial for people who suffer from depression and other similar mental health issues. All of us have bad days, but when that condition becomes constant and start preventing you from living a normal life, then it’s a serious issue. Obsidian has a great power to release all the negativity and bring some joy into your life. It helps us see the world in a much more positive light and realize that there’s a lot to live for. Anxiety is another common problem, especially for shy, sensitive people. Wearing rainbow obsidian jewelry helps in those situations, especially if they’re of social nature. It will make meeting and talking to new people much easier, as well as situations like public speaking and job interviews. Overall, obsidian promotes spiritual growth and a better understanding of oneself. When we’re at peace and happy, everything in our lives starts to go better. Being aware of our virtues, as well as faults, also makes us more centered, strong, and confident. So if you feel like you need help in any of those areas, wearing obsidian rainbow eye jewelry is the perfect way to do that and attract more positivity, happiness, passion, joy, and abundance in your life.